Fabco-Air’s newly released grippers use only 3 moving parts, and have overcome seven 7 design flaws typical to other gripper designs. 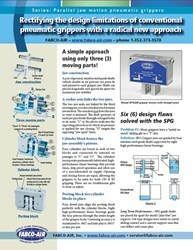 Fabco-Air SPG Series pneumatic grippers are a revolutionized approach from conventional gripper design. New White paper illuminates solutions to seven (7) typical design flaws hindering performance of conventional pneumatic grippers. Various design comparisons are presented with exploded-view diagrams and close-up photos. Verifying parts presence, and more. For more information contact FABCO-AIR. Fabco-Air was founded in 1958 by Alfred W. Schmidt in Cleveland, Ohio. Known for its many fluid power innovations like the Pancake® Cylinder, Fabco-Air has operations now housed in 61,000 sq. ft. in Gainesville, Florida. Their 24/7 lights out precision machining centers drive production, assure product quality and enable reliable delivery. The company has a dedicated workforce of 75 people whose average length of employment is more than 17 years. The key marketing contact is Scot LaMar, Vice President.